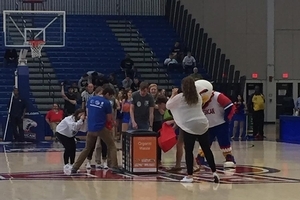 Fans in attendance at Bender Arena this Monday night will be part of American University's team for a sustainability win. Fans will learn how to bin-it-to-win-it for recycling and win big in energy reduction. American University's basketball game against Holy Cross on Monday, Jan. 22 at 7 p.m. will be a night of excitement for Eagle fans and sustainability stars. The campus community will join together to learn about sustainable lifestyles as we work toward American University's goal of carbon neutrality by 2020. A zero waste race, raffle, and sustainable giveaways are just some of the opportunities for fans to live green and cheer red, white, and blue. In partnership with AU's Office of Facilities Management and Office of Sustainability, along with the support of corporate partners Aramark, Big Stuff Inc, & RSI, Coca-Cola, DC Sustainable Energy Utility, Duke Energy Renewables, and Lucid Design Group, "The game will be both an educational and fun night, as we do our part to join the campus community in pursuit of carbon neutrality," said Robert Sherman, Assistant Athletics Director for Marketing. "The Office of Sustainability is thrilled to continue to partner with the Department of Athletics and with Facilities Management for the sustainability Basketball Game," said Megan Litke, Director of Sustainability Programs. "Every member of the AU community has a role in carbon neutrality, and it's a great opportunity to highlight leadership in sustainability across campus." AU's Assistant Director of Facilities Operations, Mark Feist, added, "The Facilities Management Team joins the Office of Sustainability in celebrating our day-to-day commitment in sustaining a green campus through a recent introduction of mixed recycling on campus along with a renewed focus on organic collection and a continued commitment to energy efficiency." All fans are invited to stop by the sustainability fair next to Section 112 on the main floor of Bender Arena. The fair will feature environmental student groups including the Community Garden and the AU Student Zero Waste Club, alongside the Office of Sustainability and AU Energy Management. All students in attendance can enter a free raffle to win a Coca-Cola-themed bicycle. The winner will be announced in the second half and must be present to win. AU Energy Management, in conjunction with the DC Sustainable Energy Utility, also will raffle off three energy efficiency kits with LED lightbulbs, a smart power strip, and a faucet aerator valued at $35.